Detail of text page with honeycomb overprinting, beeswax edge. 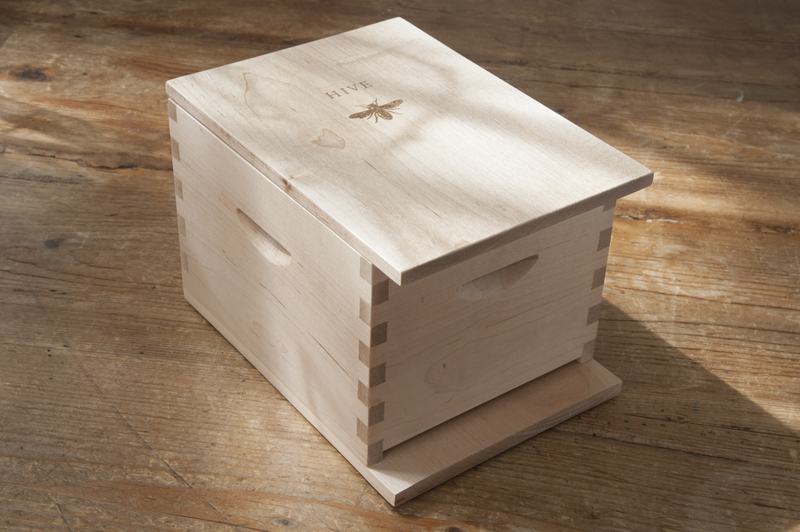 Hive was created to reveal the wonder of sunlit bees in the air and the mystery of the hive. The images and the physical structure of the book came from my experience as a beekeeper. On first reading of these words of British poet laureate Carol Ann Duffy from her book, The Bees: Poems, it was clear that her words about bees as a symbol of endangered nature and my images of bees in flight would illuminate each other. I can watch the bees from my bedroom window and have spent many hours fascinated by them and the trails they make as they enter and leave the hive, swirling around it. Capturing this experience on film was a technical challenge, solved by creating an outdoor studio, using a black backdrop and the mid-day sun, then the opening the shutter just long enough to capture their flight. The eight photographs included were selected from thousands made over the course of three years. After obtaining permission to use nine poems of Duffy’s, I was accepted into the Winter Letterpress Residency at Penland School of Crafts. There, I worked on honing the structure and materials for Hive, and printed the text. The form of Hive is a half-scale replica of a Langstroth hive, invented in the 1850s, which allowed the beekeeper to look inside the hive without destroying the bees, their honeycomb and their young. The pages, modeled after the ten frames inside the hive, hold poems and images conveying the sweetness and strength of honey and pollen and the vibrancy of young bees in their industrious work in and out of the hive. The beeswax-edged pages can be carefully removed and inspected, recreating the privilege of visiting inside the hive and sharing in the mysteries held within. In February, I had the honor of meeting Carol Ann Duffy, Britain’s first woman Poet Laureate, at Emory University on the occasion of The Raymond Danowski Poetry Library Reading Series and presenting Hive to her. The project had come full circle. concelebrants. The hive is love . . .
. . . the hive, alive, us – how we behave.